Zeppelin wasn’t in our lives for very long, but the love we shared for each other was timeless. We adopted Z from a shelter in July 2014. His name then was “Gramps”. He was big. He was black. He was old. He was the best well mannered gentleman I had ever met. Someone loved him before he was found as a stray…someone spent a lot of time on him. He had been at the shelter for 4 months, we were his last chance. From the moment I saw his picture and story on the adopt me website it was as if he was waiting for me…for us. My two boys, my two small white girl dogs and I hopped in the car and took the drive to Black River Falls. My gosh he was breathtaking! He was ours from that very moment. I knew we couldn’t and wouldn’t leave him there. He had some pretty serious health issues. DM and Laryngeal Paralysis. His prognosis wasn’t great. This was July. I prayed we got him to the birthday we chose for him…Thanksgiving Day. The vet determined he was 12 or 13. He quickly became part of the family. From our twice daily walks, to playing with our boys & friends, to snuggling with our miniature goldendoodle…he was just a Higgins from the moment he walked in the door. We quickly learned he loved to play football and catch tennis balls. We got 355 days with him. Not enough. Not nearly enough. 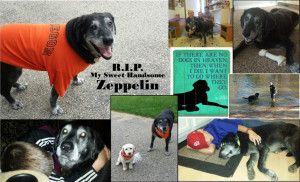 Thank you so much Dr. Katie for allowing Zeppelin to go with dignity surrounded by his family. We are so grateful to you. Our hearts are still hurting but know in time they will heal and become happy, loving memories of our sweet, old gentleman. Thank you!